These stimulating topic-by-topic activities ensure students get to grips with the essential terminology in the 2016 GCSE AQA specification. Every keyword and term is defined and taught through a series of activities and memory games. The content for each Topic is broken down into 4–11 sets of keywords, with sub-topics linked to the specification key ideas. New for the 2016 specification: Now a digital resource! All activities are provided on a CD-ROM which can be copied directly onto your school network and accessed through a custom interface. 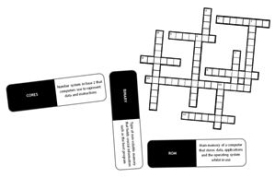 All activities are available in PDF format and crosswords are also fully interactive!